This is massively disturbing for me. I lived in Billings, Montana at one time. They are great people and down to earth. My, how things have changed out west and not for the better. The town that I loved just officially elected a socialist. They put a Democratic Socialist of America member named Denise Joy on the City Council. WTH were they thinking? What’s more, if you look at the article at the Billings Gazette, there are just as many who love this Marxist as those that hate what she stands for. It’s demoralizing. The media is romanticizing this woman. They are gushing over her win and they are going out of their way to humanize her and try and endear her to Americans in Montana. Denise Joy will now take a seat on the Billings City Council representing Ward 3. And you can bet that the DSA has others in the works there. They never stop and they are constantly working on getting socialists into office around the country. Originally, she trailed her opponent by 11 points in the primary, but with the help of Democratic Socialists of America, she would up winning by 17 points. Why? Because people no longer remember what a ‘socialist’ is or that they are basically a communist in the making. Joy is the only DSA member so far to be elected in Montana to a public office. We can only hope this is a one-off anomaly and that she’s gone sooner than later. She did not hide the fact that she was a DSA member, but she didn’t campaign on it either. There is a small group of DSA members in Billings and their hard work paid off unfortunately. This is a ward that strongly supported Donald Trump. Which makes this even more confusing. “The label of ‘socialist’ may make people nervous,” Joy said. “But what it means is paying it forward and investing in our community. And that doesn’t scare them.” No, it is a soft lie that confuses voters. And when Americans no longer know what is in the Constitution, what the history of their country and the Founding Fathers is, or the real definition of ‘socialism’, this is what happens. They begin to give away their freedom to those that want the teachings of Marx implemented. Democratic Socialists of America claims to have approximately 30,000 members nationwide. Personally, I think that number is nowhere near the number of members they have. DSA has chapters all across the US now. The organization saw a major growth spurt when Bernie Sanders ran for the presidency. He has tripled their numbers according to reports. Joy’s win was part of a wave of victories for DSA in the 2017 elections. They focused primarily on local government positions. 35 DSA members currently hold elected office. But here’s the catch… a number of them don’t admit to supporting or being part of the organization for political reasons. They are stealth socialists, Marxists and communists. The Billings DSA’s efforts often overlap with local Democrats. DSA is going after those who support Obamacare and free tuition. Those are socialist building blocks here in the US. They push progressive politics and many times they sound great, but they are anything but that. The Democratic Party is now the Socialist Party in reality. DSA will also be supporting two Democrat statehouse candidates next year. One of them, Amelia Marquez, is a vice chair for the Yellowstone County Democrats and will run in House District 52. That overlap is going to be common with just about 20 local members, said Josh Schleining, organizer and chairman of the Billings DSA. The group is working to get recognition by the national branch as a local chapter. The Billings DSA’s efforts frequently overlap with those of local Democrats. “We’re trying to function on our own on one hand, but also if there’s any organization, political parties, anyone we agree with on their stance, we try to help them,” he said. Joy’s socialist policies are enticing to many young people who want something for nothing. They are as old as communism is. Joy talked a lot on the campaign trail about the strategy of Billings’ urban sprawl and how it might divert resources away from her mid-town ward. She said she wanted to see investments in curbs, gutters and street lights in neighborhoods that could use them. Socialists always seem to help, but in the end, you are taxed to death and oppressively controlled by politicians and the government. The true equality for socialists is one of impoverishment and desperation. People all become equally miserable. “You’re not just trying to make a nicer street,” she said, “you’re investing in your own savings, in your own home.” But what she forgets to tell the good voters, is their investments will go through bureaucrats who will keep most of it for themselves. It ALWAYS works like that. And their taxes will go through the roof, while things only get worse in their ‘home’. Now, this is where Joy gets disingenuous in the extreme. She’s very crafty here. She said she wanted to make sure law enforcement had the resources needed to keep up with Billings’ growth. She said officers are often the only point of contact between the city and residents who could benefit most from public services. First off, socialists hate the police… unless they are part of a governmental system to control the populace. Here you see Joy trying to win the police over to her way of doing things. The persuasion of socialist politics is the siren call of tyranny. 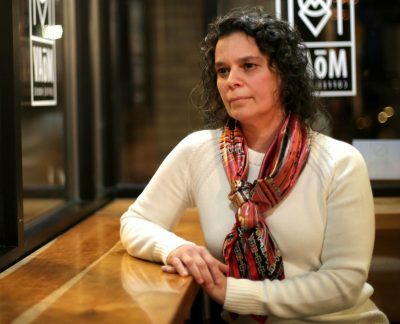 “Police are out there, and these issues of addiction and mental health just collide with what the police need to do to keep the community safe,” she said. And this is where the rubber meets the road… that sentence you just read… what she is talking about there is ‘gun control’. I’m not kidding. These are the political issues socialists dangle in front of people as justification for stripping Americans of their Second Amendment rights. It’s the socialist thing to do. 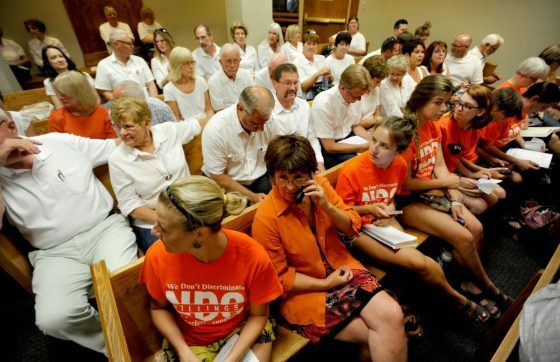 Supporters (wearing orange) and detractors (wearing white) of the NDO wait before the Billings City Council meeting to vote on the proposed Non-Discrimination Ordinance in 2014. Another issue is a non-discrimination ordinance, which has hovered around local politics since the Billings City Council defeated the measure in 2014. Joy supports it. That’s meant to mainstream homosexuality and gender choice. It plays into open-bathrooms and the normalization of perversion too. You see, socialism and communism can’t get a hold of a people unless they break apart the family unit, get rid of morality and faith and get the guns. Joy will begin her evenings with the Billings City Council in January. By day, Joy is a special-needs assistant at Ben Steele Middle School. She grew up in Hardin. She works with the Amend Park Community Garden, which she says is a socialist idea. She doesn’t consider herself radical. Communists and socialists never do. “It’s all about affordability. It’s all about living wages, and that’s what people care about. And that’s a part of socialism. That’s a part of the idea that collectively, we need to address these problems,” she said. No, what we need to do is purge ourselves of socialists like Joy.